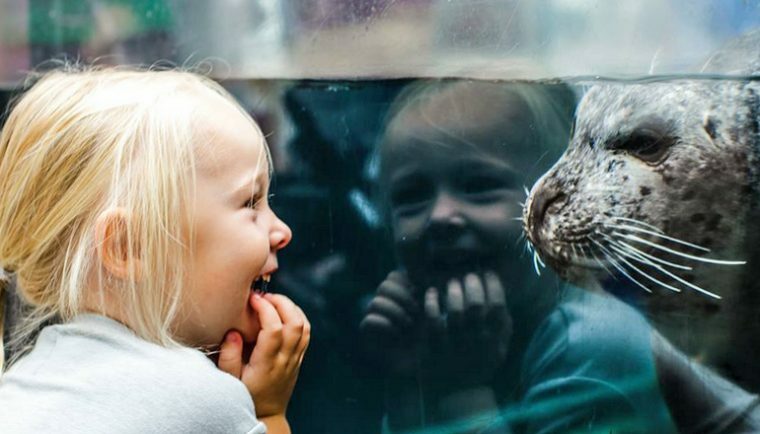 The marine mammal trainers at the Aquarium are always looking for new ways to challenge and play with the seals and sea lions. 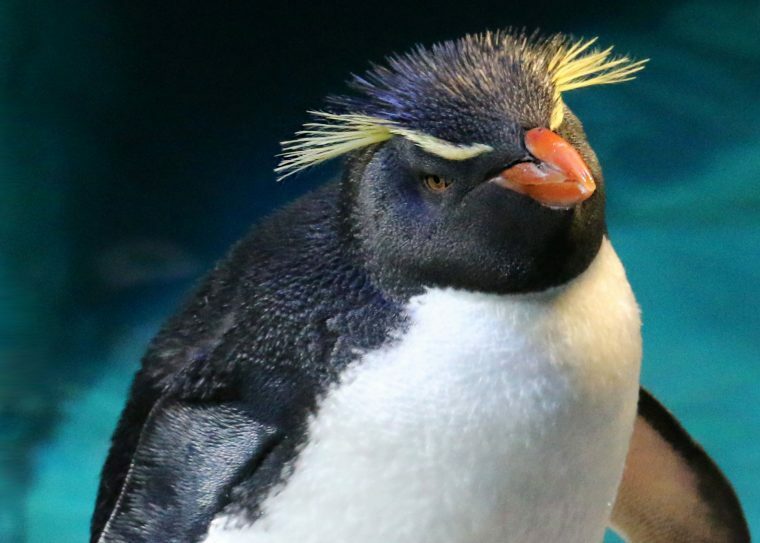 These activities are called enrichment, and they keep the marine mammals healthy in both mind and body. Sometimes, volunteers create new toys for the seals or freeze fish in big blocks of ice that bob in the water. The Fourth of July holiday presented an opportunity to create fun red, white, and blue enrichment. 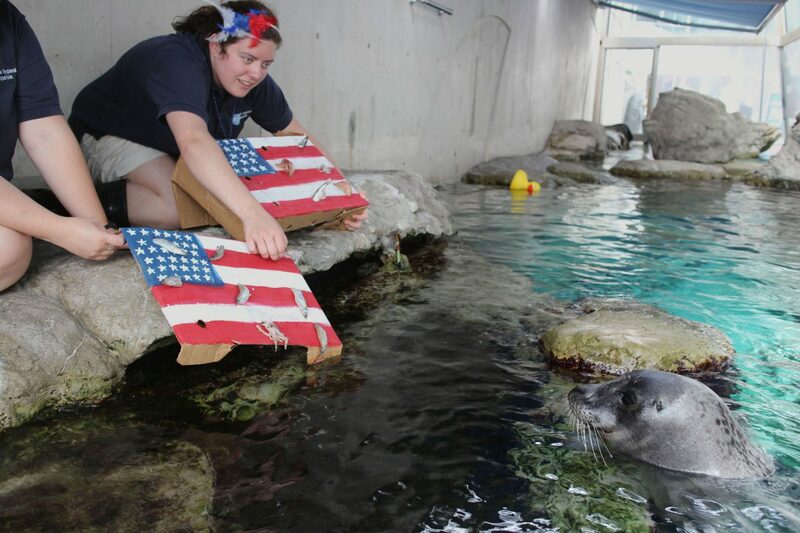 Trainer Jess painted a replica flag with bright colors and new (for the seals) patterns on a box, which served as a festive snack delivery. 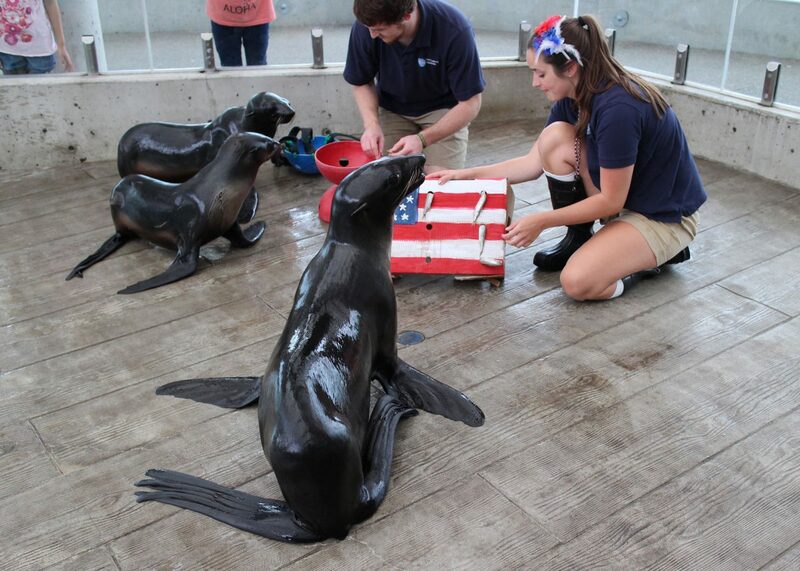 As you can see, the fur seals—Luna, Kitovi, Chiidax, and Ursula—were all very curious about the boxes. All the fur seals came over to inspect the festive enrichment. Plucking the treats from the holes was a tasty bit of fun! 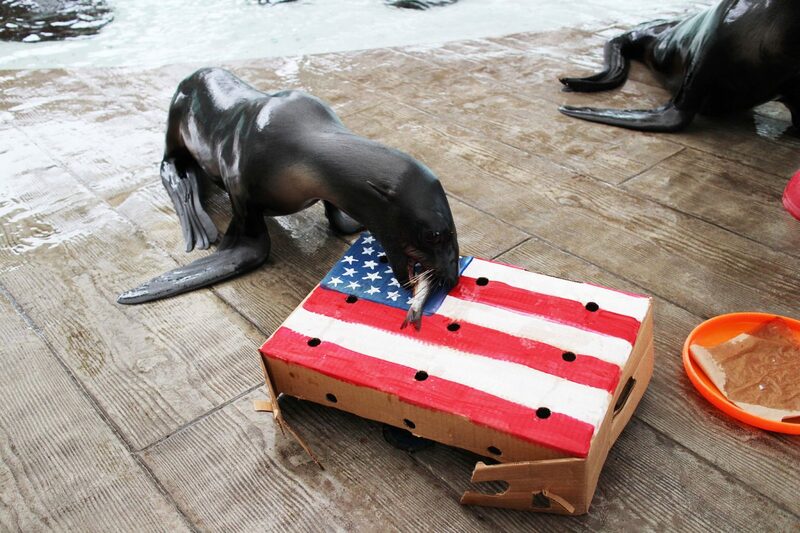 The trainers also brought the flag-painted boxes to the harbor seal exhibit. The harbor seals were curious and swam over for a look. But in the end, they did not take part in the festivities. 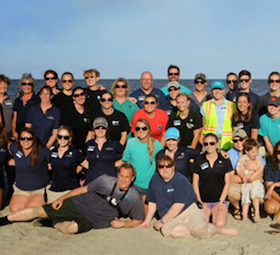 While our seals and sea lions have a lot fun with the trainers, they also work together to learn many skills. Sometimes, the skills help with the animals’ medical care. Sometimes, they are more of a fun challenge mentally and help the animals and trainers develop a trusting relationship with each other. These salute skills are another great tie to the Fourth of July holiday! 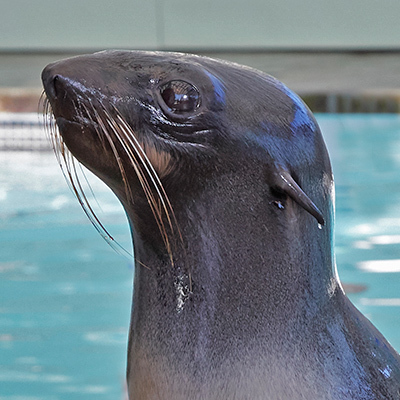 Visit the Aquarium to learn more about the rescued seals and sea lions that live here. 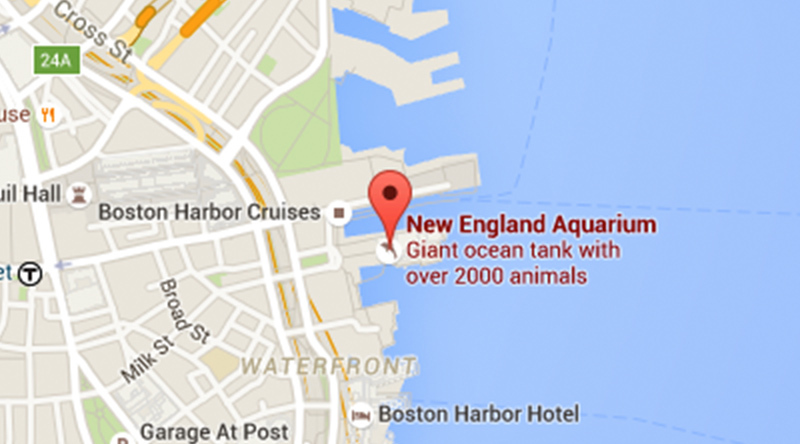 You never know what new toys or activities will be engaging these marine mammals!